All-you-can-eat. When strung together, those words become some of the most beautiful in the English language. On Sundays at A-Frame, all-you-can-eat is the name of the game, with AYCE chicken at night and AYCE pancakes during the day. Having partaken in the glorious excess of AYCE chicken night, I returned during brunch for pancakes. Set in an old International House of Pancakes, A-Frame derives its name from the shape of the building. 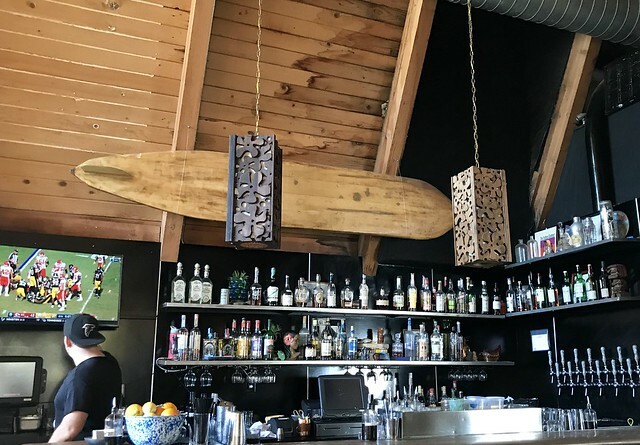 Roy Choi, of Kogi Taco fame, transformed the spot into a Hawaiian-esque themed restaurant. The All You Can Eat Stacks on Stacks gives you four different pancakes to devour. Unlike the decadence of AYCE chicken where the food is dumped from a bucket onto your table, this is a much more refined experience. You choose one pancake flavor at a time and will be served a plate with two pancakes, roughly 5 inches in diameter. The pancakes are pretty standard, neither over-the-top with the ingredients nor particularly light and fluffy. Their most defining feature seems to be whatever gets placed on top. The mochiko chicken, which is also offered as part of AYCE Chicken Night, was a little uneven. Some pieces were quite dry and needed a good dose of maple syrup, while others were fine. The banana mac nut pancakes were better, topped with a banana puree, macadamia nuts and whipped cream. Sad to say, after eating two plates of pancakes, I was too full to eat any more. AYCE Stacks on Stacks costs $16, so unless you can eat a whole mess of pancakes, I recommend ordering one of the other entrees, like the breakfast plate – homemade SPAM, Portuguese sausage, scrambled eggs, rice, macaroni salad and a Hawaiian roll. Their SPAM was more like SPAM-lite, not the fatty sodium bomb of the original. It’s a lot of food, which reheats beautifully the next day (I highly recommend the meat and eggs in a leftovers breakfast sandwich). A shrimp burger was the special of the day. The patty was quite flavorful and chock full of shrimp. During brunch, there’s also an All You Can Drink option, with Micheladas, Mimosas or Bloody Marys. There’s is a time limit though, so they won’t have to roll your inebriated body out the door. Zac Efron hiding in the back right corner, behind his date. High School Musical’s Zac Efron happened to be there – though I don’t think he chose the AYCE or AYCD option. They even seated another party at his table, since sharing tables is to be expected. If you come to A-Frame, you may find dining with a Hollywood celeb included in the price of your meal. Bonus. Vegetarian/Vegan Friendly – Does kale salad count?